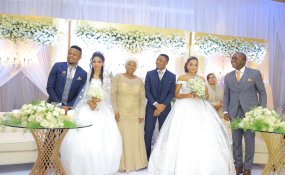 Dar es Salaam — The second wedding party for Tanzanian singer, Ali Kiba was held in Dar es Salaam yesterday, gathering leaders and celebrities from across the region. Yesterday's event came in just days after Ali Kiba held a glamorous and luxurious wedding ceremony in Mombasa a few days ago. The event, which was held at Serena Hotel Dar es Salaam yesterday, was attended by former first lady, Ms Salma Kikwete. Mrs Kikwete was attending the event on behalf of her husband, former President Jakaya Kikwete. The event - which was televised live - was attended by the Minister for Health, Community Development, Gender, the Elderly and Children, Ms Ummy Mwalimu, the Deputy Minister for Labour, Youth and Employment, Mr Antony Mavunde, Natural Resources and Tourism minister, Dr Hamis Kigwangalla and Chalinze legislator, Mr Ridhiwani Kikwete. The Governor for Mombasa in Kenya, Mr Hassan Joho - who doubles as Mr Kiba's close friend - was also among prominent guests at the event. Local artists who attended the event included: Hamis Mwinjuma alias Mwana FA, Christian Bella, Vanessa Mdee, Mimi Mars, Eshi Buheti, Idrissa Sultan and Omary Nyembo, popularly known as Ommy Dimpozi.